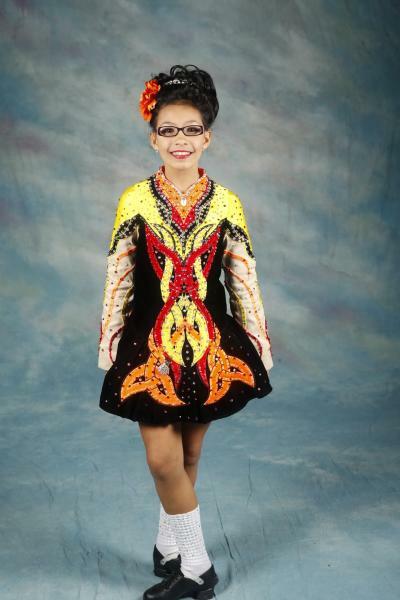 dance.net - Eye-catching Taylor dress U11-U13 fully stoned, really shines on stage! (10243427) - Read article: Ballet, Jazz, Modern, Hip Hop, Tap, Irish, Disco, Twirling, Cheer: Photos, Chat, Games, Jobs, Events! 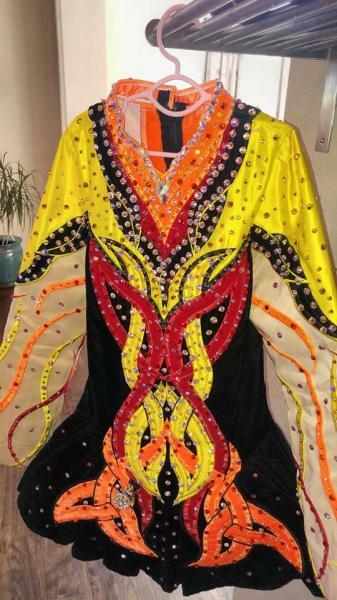 Eye-catching Taylor dress U11-U13 fully stoned, really shines on stage! Eye-catching Taylor dress for U11-U13. Fully stoned with hundreds of crystals that really catch the light on stage. Yellow and champagne satin, orange and black velvet really stand out in a sea of red and pink dresses! Worn by two WQ, two years old. Asking $850 negotiable, includes free shipping and delivery confirmation in US. Shoulder seam to shoulder seam front 11"
Shoulder seams across back 11.5"
Neck to shoulder seam 3.5"
Length front shoulder to hem 27.5"
Length back shoulder to hem 28.5"
Dress will be at Coyle Feis.